Listening to their hearts beat. Is black like a blackboard. On their way to the kitchen. At the FUBiS program in Berlin in the summer of 2014, our teacher Samuel Adler asked each of the program participant to write a song. 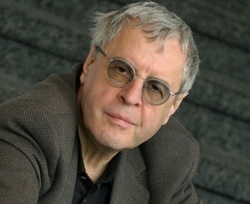 I chose Charles Simic's "Greyheaded Schoolchildren." Dr. Adler, when I showed him the poem at the first lesson, said, "It's a sad poem... especially for me." He then instructed me to write three piano introductions to the song. I picked the first, quiet lonely notes at the ends of the range of the piano, and went on to set the poem somewhat ironically and quite dramatically. I hope that one day this song becomes one in a set of Simic settings.